Organic Soul from Alexander's Real Time Band. A little something to lift your spirits on a cloudy day. 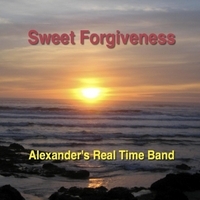 This is the 3rd studio release from Alexander's Real Time Band. Each new song showcases the band performing in a different genre. So far we have heard Bossa Nova ('Peace of Mind') followed by Reggae ('My Old Neighborhood). But this release, 'Sweet Forgiveness', is closest to the "Organic Soul" tag used to describe this band to industry professionals and the press. This is also the first release from the band to feature only the core quartet members. Whit Draper lays down some extremely soulful blues guitar for this one. Sarah Linderman brings her signature 'unplugged' rhythm using cajon drum and cymbals. Susan Peck plays a jazzy rhodes style electric piano. Band leader, Alan Alexander III, performs on fretless electric bass, organ, and lead vocals. Add to that the gospel harmonies of Sarah and Susan's background vocals and you have a taste of musical magic recorded (mostly) live at Dub Squad Music studios in Portland Oregon.